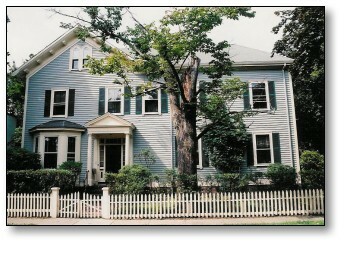 21 Bowdoin Street was built in 1875 and occupies a prominent corner amongst other interesting houses of varied architectural styles. The property is located in the desirable Radcliffe/Avon Hill area of West Cambridge, within walking distance of Harvard Square and all of the amenities of Massachusetts Avenue. The wonderfully preserved interior is replete with architectural features of the period; including fireplaces, crown moldings, and interesting built-ins. The 2,800+ square foot interior, with room for possible expansion, is well proportioned and includes 5 bedrooms, 3.5 baths, and a charming library with a fireplace. The living room, with its strong sense of symmetry, seven windows and a fireplace, is of unusually gracious proportions; and there is an equally spacious master suite. With a well maintained exterior and updates to the systems, the interior of this very special offering is indeed deserving of a restoration/ renovation. In addition, there is ample off-street parking and appealing outdoor space. Property Specifications- A comprehensive listing of facts pertinent to this property including square footage, tax information and more.